Rucksack mods require approximately 3 to 4 weeks to complete. 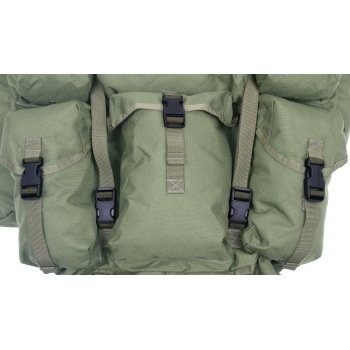 Rucksacks MUST BE CLEAN and free of contaminants prior to sending them to Tactical Tailor for modification. Dirt and grime can cause damage to our sewing equipment. Excessively dirty rucksacks may need to be returned to the customer at their expense to be cleaned. This mod replaces the metal snaps on the three main pockets and the metal buckles on the main straps with quick release Fastex buckles. Gives you faster and easier access to the contents of your rucksack. Ruck modifications can only be added to standard-issue style ALICE packs and Tactical Tailor MALICE packs. To add modifications to other manufacturers ALICE-style packs, please contact the custom shop directly for pricing.